Went to the Marlborough Pub on Friday for a pub dinner. Located on Friar Stiles Road, it’s a cosy pub, nicely decorated with a well-to-do clientele. I guess I determined the “well-to-do” bit by both the prices on the menu, and the way people dress. On a Friday evening, many appeared to still be dressed from their day at the office, though it’s difficult to tell whether they walked up from Richmond Town or are on their way back home. The pub food here is very nice. It is about 20% more expensive than other pubs I’d been to. 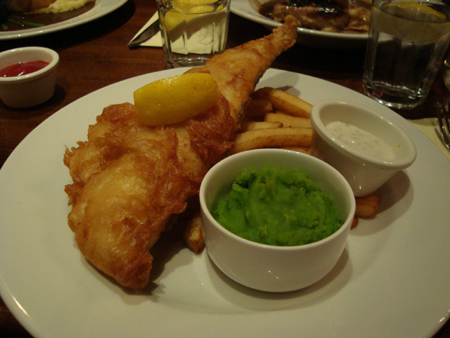 (There’s also a really nice pub called The White Lion in Covent Gardens that serves great pub food. Kids can go in as there is a family dining room away from the bar.) Anyway, the standard pub fare is very well done: Fisn and Chips, Steak and Ale Pie, and Bangers and Mash. I especially like the pie. Prices are around 10 pounds a meal. I have tried some of their other meals, like their seafood linguine pasta, and would suggest that you give that a miss. It was quite watery, like they did not drain the pasta well. Also, it tasted like they stewed the seafood rather than grilled it. Anyway, it wasn’t awful and was still tasty, but it was not to my taste. We tried a couple of new dishes this evening. That included an interesting entree Baked Camembert with raspberries. Very simple, just literally baked camembert and slightly stewed raspberries and berries. Looked great and tasted great too. Very easy to make at home also. I also decided to try game and ordered a Roasted Pheasant with red cabbage and spring onion mash. This cost about 14 pounds, which I thought was very expensive given that they gave only 2 little slices of pheasant and lots of mash. Anyway, pheasant was quite nice but not sure whether I am bowled over by pheasant generally. I found the meat dry and a little bit tougher than chicken. Hubby ordered the Baked Pork and Crackling with apple sauce and black pudding. Not sure about the black pudding – a couple of small slices was enough for me, but the pork and crackling were really nice. The atmosphere in the pub is quite cosy. The front section has lots of casual sitting areas, with big armchairs and little tables scattered around. If you looked at one little section, it could be someone’s cosy dining/sitting area. There is a dining room towards the back, and an outdoor sitting area. Smokers go right out the back in the back garden to smoke. With the cold weather now here and Christmas coming, it really has a cosy, cosy feel to it. It feels quite surreal for me to be part of this pub scene rather than someone looking in. It’s a scene that I’m used to seeing in picture cards/books or in movies. How strange for me to see myself now in it. For me, Christmas had always been hot and bright, long days, no fire (except for a barbie), and in shorts and T-shirt. I am noticing the difference and enjoying the experience of it and I absolutely marvel that I am in living in England, and never in my life did I think I would do that! And if what I never thought was a possibility is now available to me, then it makes me think “What should I ask Santa for” this year? Just absolutely wonderful.